Let me say right up front that this is one of my favorite fly-fishing films of all time. And that’s saying something. As curator of the Friday Fly-Fishing Film Festival and The Tug, I probably watch more fly-fishing videos than almost anyone. “Das Fischer,” a hilarious new production by director Ben Herndon, displays a level of sophisticated filmmaking that we don’t often see in the sporting world. The set design, props, acting(! ), and cinematography are simply spectacular. 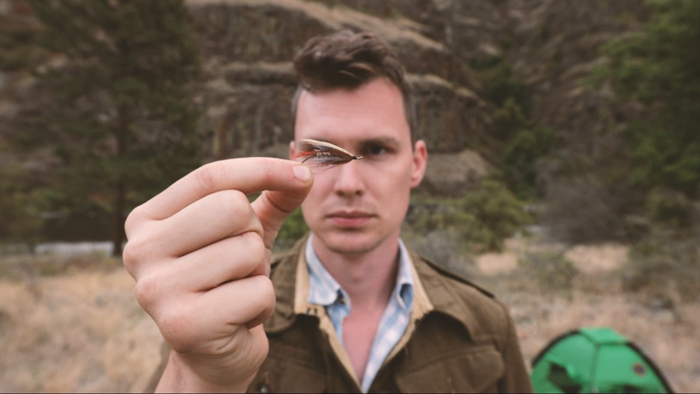 The film tells the story of a German man who is enthralled by a magazine article about fly-fishing in Idaho, so he sets out on an adventure to experience the waters of the Gem State himself. Let’s just say that hijinks ensue. And we may have found a new icon in the person of Hildebrand Richwine. The film is nine minutes long, but I was sad to see it end. I hope you enjoy it as much as I did. If you want more info, check out the film’s Facebook page. Warning: there is one printed word that some may find offensive, so parental guidance is suggested.